Tis the season for potlucks…at least it is around here. In our family, usually the moms make the main course and the daughters and daughters-in-law bring the side dishes. I usually offer to bring a salad or veg. 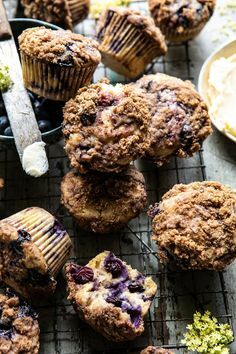 But, I’ve been in a bit of a rut lately, making the same dishes over and over. Dylan is convinced that she’s OD’d on brussel sprouts. 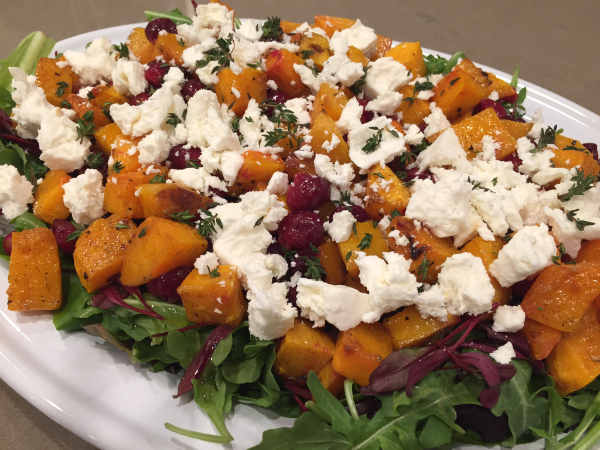 I came across this dish for Honey Roasted Butternut Squash with Cranberries and Feta by Peas & Crayons on Pinterest and thought I’d make a salad out of it for a dinner at Jason’s parents. It was delicious and a nice change to my usual veg and salad repertoire. I will admit that peeling the butternut squash a total pain, but the result is worth it! For the greens, I used a combination of baby romaine, arugula and micro beet greens…the purple greens add great color to this salad. 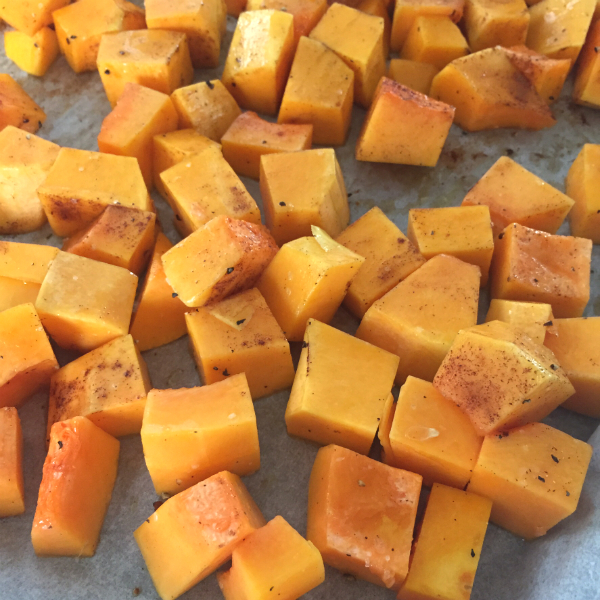 Put cubed squash on parchment lined baking sheet and drizzle with olive oil. Sprinkle with a light layer of sea salt, freshly ground pepper and cinnamon. Toss together. Roast for 20-25 minutes on the center rack. While the butternut squash is roasting, blend apple cider vinegar, olive oil, agave and salt and pepper to taste for the vinaigrette. 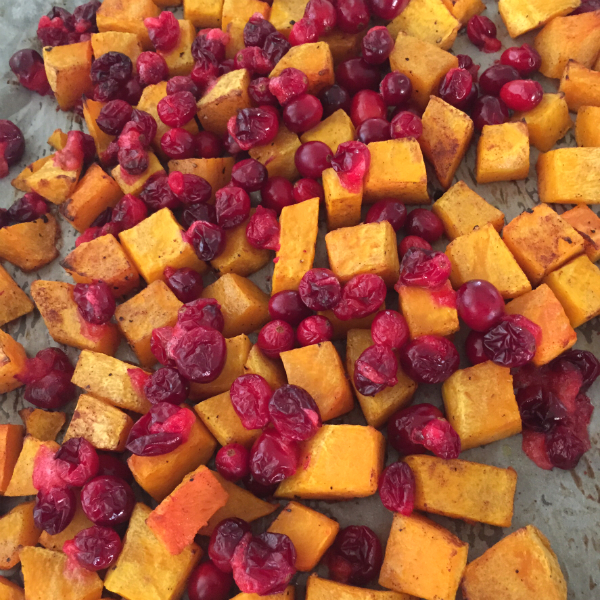 At the 20-25 minute mark, pull out the oven rack, and add your fresh cranberries to the roasting pan. Return to the oven for 10-15 minutes or until the cranberries have started to soften and burst a bit. Remove from oven and add 3 Tablespoons honey. Toss together. Put greens on a large platter and dress with the vinaigrette. 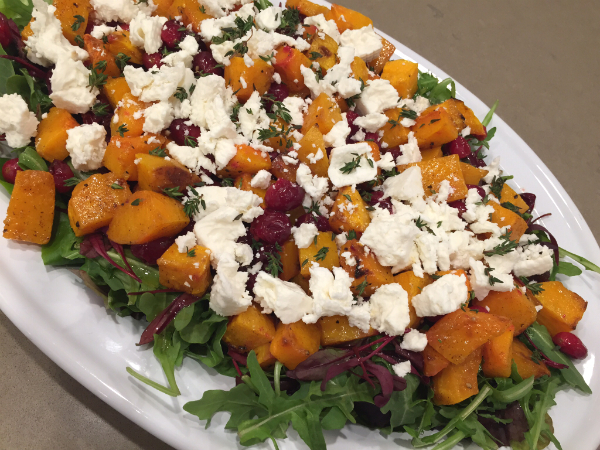 Top with roasted butternut squash and cranberries and crumbled feta. Garnish with fresh thyme leaves. I know that Christmas time is so crazy busy and prepping in advance is the key. The great thing about this recipe is that you can roast the butternut squash and cranberries in advance and serve at room temperature over the greens. Serving this salad in a large white serving platter makes the colors really pop. The cinnamon and cranberries make the flavors of this winter salad so festive and the perfect addition to your Christmas dinner.